The Friends of South Hill Wood and Kingswood Glen are a volunteer group who want to protect and develop our local green spaces. The school is actively involved with the group and children from our school designed the FSHWK logo. The friends group were chosen for an award at the People for Parks Awards Ceremony in 2010. This was in recognition of the work they had undertaken in actively engaging the local community in protecting our green spaces. Highfield Infants' School continues to support FSHWKG and regularly use South Hill Woods for science investigations and to stage our annual Lollipop Walk to raise funds for the school crossing patrol on South Hill Road. We also support their annual South Hill Community event held in South Hill Woods and the school choirs have become a regular fixture at that event. 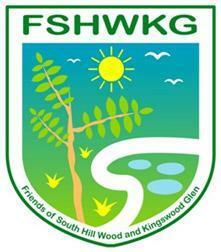 If you would like to become a member of the Friends of South Hill Wood and Kingsbrook Glen please email fshwkg@outlook.com. FSHWKG publish a regular newsletter and information sheet detailing local nature, a selection of which we attach here to help you enjoy Bromley's green spaces better.